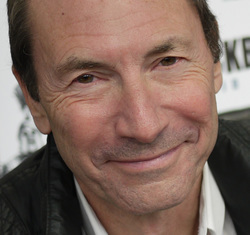 David Lloyd made his debut as a comics artist in 1977. His work began to be noticed when he took on jobs from Marvel UK, where he played a significant part in giving life to a popular warrior against crime, Night Raven, a forerunner of his most illustrious creation: V, the iconic and subversive star in V for Vendetta, dreamt up with Alan Moore in 1981 in the pages of Warrior magazine. Since then Lloyd has worked for nearly all the UK publishers and for some American ones, such as DC Comics, in particular his contributions to Hellblazer and the limited series Global Frequency. Recently ECC Ediciones has published a new hardback edition of V for Vendetta.